The free-to-play, location-based augmented reality game, Pokemon Go, is finally getting a makeover, as it's been the same egg-hatching, monster-hunting, and candy-grinding experience since it made debut in July 2016. Niantic Labs, developers of Pokemon Go showed off two big updates coming to the game, with promise to make Pokemon raids battle ready. While previous updates had focused on a few critical fixes, UI tweaks and adding a second batch of Pokemon, with the new release users will be getting a complete makeover. And foremost, gym battles is getting a complete overhaul, which is about now rolling out in the US; as with the current gym system having elite players to drop six Dragonite on every gym, and to fight a series of tougher Pokemon to make it to the top, these won't be the case anymore. With the new update, each gym as always having six slots available for a team to contribute, players will have to come visit their Pokemon and track their physical/mental form through a gauge, which empties overtime. Also, there'll be a new reason to visit gyms, as each visit will now double as a PokeStop, so players can spin its sign to collect some items as well. Albeit, there will be a limit of one to any given Pokemon per gym, and players will earn unique badges from each Gym which they can level up from Bronze to Silver or to Gold. The new boss battle mode (dubbed Raid Battles), is where those "Legendaries" will actually make appearances. As Pokemon Go catchphrase "Gotta catch 'em all" goes, the rarest, most valuable legendary Pokemon have been entirely off-limits, so it's never actually been possible in gameplay. Now, when a player see the countdown timer and giant egg appear above a gym, along with 19 other friends can fight an incredibly powerful Pokemon, again and again until the timer runs out. And each participant will have a set number of chances to catch the powerful boss Pokemon with special new Poke Balls. Though, a "Raid Pass" is required, which you can get one per day just by touching any gym. 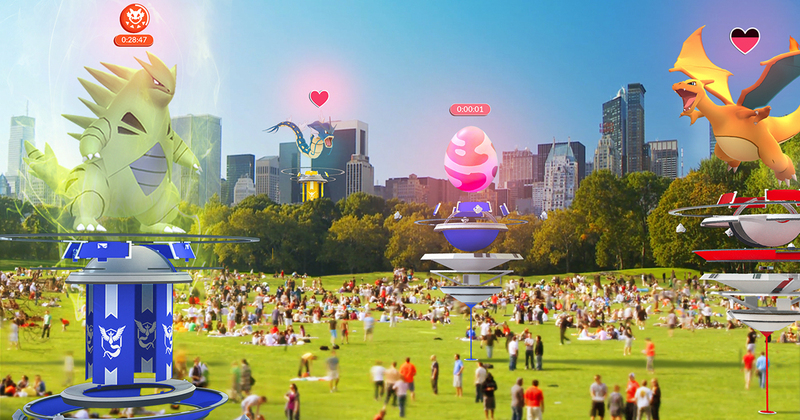 Niantic, however, says releasing the Raid Battles won't happen, until the new gyms have rolled out across the world.